Microsoft is listening to our feedback and gives us the choice between differencing or dedicated disks for the VM role gallery item with Update Rollup 5 for VMM & WAP. Prior to UR5 you had to use a SMA runbook like the one I have published on the TechNet gallery to convert a VM’s OS disk to a dedicated disk right after the creation process. The disk deployment settings are set on a per cloud basis. 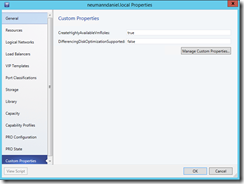 That means that you have to set a custom property on a VMM cloud to enable the specific deployment behavior. It is not a setting that you will provide within a single VM role gallery item. There for you have to split your workloads into different VMM clouds. For example one VMM cloud for production workloads with the dedicated disk deployment and another VMM cloud for test or development workloads with the differencing disk deployment. Based on that model you will have as a minimum two different hosting plans in your WAP environment. To enable the dedicated disk support on a VMM cloud execute the following PowerShell cmdlets on the VMM server itself or on a workstation with an installed VMM console. Select the VMM cloud on which you would like to enable the support for dedicated disks. 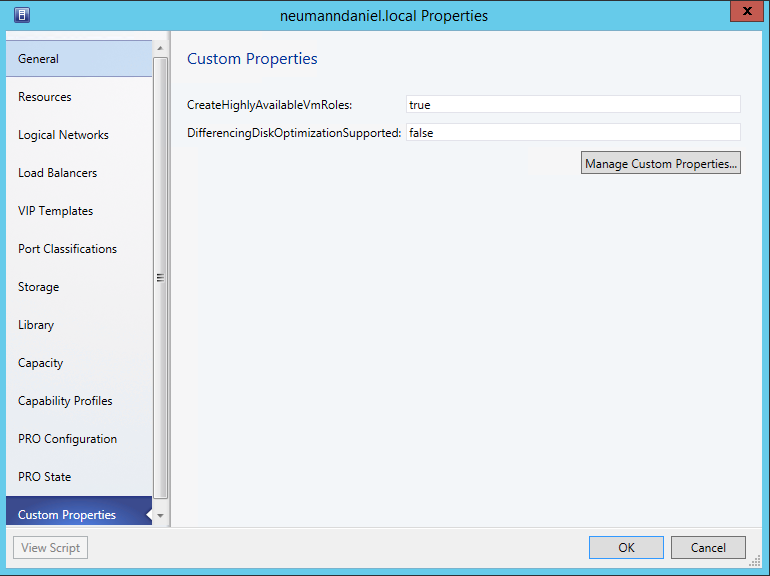 Then you create a new custom property called DifferencingDiskOptimizationSupported. The last step is to set the custom property value to false, if you want the dedicated disk deployment. Otherwise set the value to true to keep the default deployment behavior with differencing disks. The dedicated disk deployment option provides you with a better overall performance for the VMs and makes it easier for you to keep the base VHD image up to date. This entry was posted in Hyper-V / SCVMM, System Center and tagged Cloud, Hyper-V, IaaS, Private Cloud, SCVMM, System Center, WAPack on 10. February 2015 by Daniel.